The answer to this question, “Who is Jesus?”, is the cornerstone of our faith. Jesus has been called by this world everything from a liar to a lunatic. But your response to this question will determine where you will spend eternity. If you believe Jesus never existed or that he is just a man then your eternal destiny is not heaven. If you believe Jesus is God but have no personal relationship with him, then you are no better off– hell is still the open door on the other side of this life. But if you believe Jesus Christ is Lord and accept him into your life as Lord and Savior then your eternal home will be heaven, and no where else. Jesus is referred to in scripture as the Lord Jesus Christ, the Lamb of God, Man of Sorrows, the Second Adam, the risen Lord, the only begotten Son of God, the Author and Finisher of our faith, the Bright and Morning Star,”the Good Shepherd, the Lover of our Souls, our Redeemer, the Rose of Sharon, and The Angel of the Lord, to name just a few. These names refer to both his humanity and his deity. Is Jesus God? Yes! He is God. Jesus is the only begotten Son of God (John 3:16). He is an equal part of the Trinity, composed of God the Father, God the Son, and God the Holy Ghost. John 10:30 says,” I and my Father are one.” Jesus is 100% man and 100% God. He was born of the virgin Mary and conceived by the Holy Ghost. The question, Who was Jesus?, is not accurate. He is God so he has always existed. He has no beginning and end. Through is life here on earth he endured everything that we endure. He was born the Son of Mary, raised by Mary and her husband Joseph, and lived to be about 33 years old. He lived a perfect life. He never committed one sin. Then as an adult of about 30 years old he approached John the Baptist and was baptized (Matthew 3:13-17) and began his earthly ministry. At his baptism John calls Jesus the Lamb of God. John 1:29, The next day John seeth Jesus coming unto him, and saith, Behold the Lamb of God, which taketh away the sins of the world. The Lord Jesus’ mission was written by God the Father before he even created man. God knew man would need a Redeemer as man could never live without sinning. For you see God planned to create man differently from all the other creation. Man would have a soul and be created in the image of God himself. Man would be formed by the hands of God and have the breath of life breathed by an eternal God into his nostrils. All of the other creation — from rocks to animals– God spoke and created it. Only man was created by the actual fingers of God. Man was given a free will. He could choose either to love God or this world. God did not want ‘robots’ that were programmed to say, “I love you, I love you, I love you,”over and over again. God desired a personal relationship with man. Satan, called Lucifier, lead a great rebellion in heaven taking many of the ‘bad angels’ with him. And so the battle of good verses evil began. Jesus was promised as early as Genesis chapter 3 where we see the serpent is cursed, man falls, and Eden is closed forever. God promises a Redeemer who will crush the head of Satan some day. Jesus is this Savior. At the end of his life Jesus was arrested for crimes he did not commit. False witnesses were hired to lie about him. Unjust judges and the Jews condemned Jesus to death. He was beaten, wore a crown of thorns, was mocked and ridiculed, and was forced to carry a rough wooden cross through the streets of Jerusalem, out to the edge of town, and up the hill of Golgotha. Somewhere along the way our Savor grew too weak and a man named Simeon was summoned from the crowd and was forced to carry the cross the rest of the way. Jesus was crucified in the brutal Roman manner with two thieves. He hung there for several hours. Then he died before they broke any of his bones. He was taken from the cross, wrapped in swaddling cloth and spices, and laid in a borrowed tomb. Three days later he rose from the dead. He was seen by some 300 or 400 witnesses and then he ascended back to heaven and is seated at the right hand of God. (Acts chapter 1). Jesus’ death on the cross is much much more than just a man being killed for something he did not do. Jesus’ death must be looked at in conjunction with his burial and resurrection. No other religious or political leader (or anyone else, for that matter), has ever risen from the dead. Jesus’ body is nowhere on this earth. He is risen bodily — so he took his body- bones and all — with him and returned to heaven. 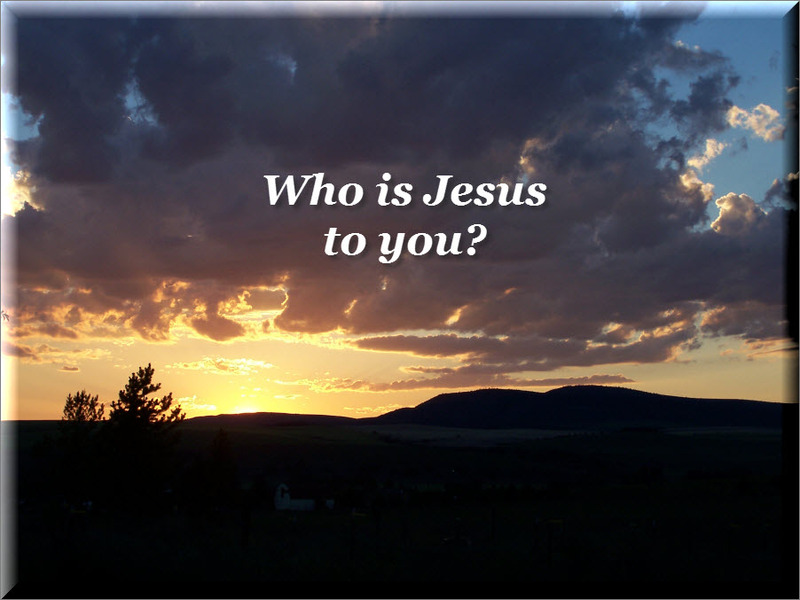 Who is Jesus to you? Do you know without a doubt that if you died today you would wake up in heaven? It is through his death, burial, and resurrection that we can have forgiveness of our sins. If we ask Jesus to come into our hearts, wash our sins away, and be our personal Lord and Savior we have eternal life. Jesus is a personal Savior. Just believing he is God is not enough. We must accept his free gift of salvation. Then we are God’s child and have the Holy Ghost living within our hearts. Who is Jesus Christ to you?